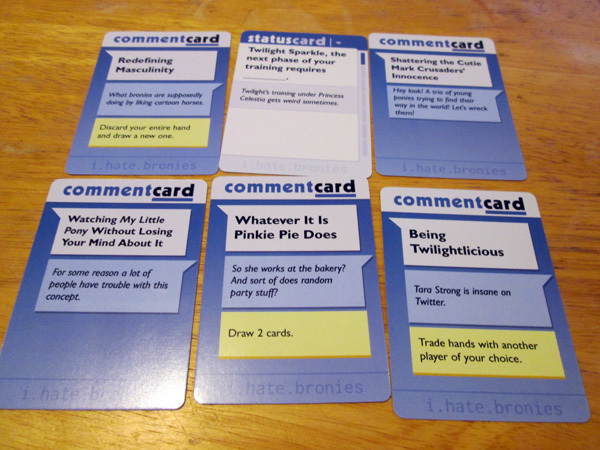 i.hate.bronies is a My Little Pony-inspired expansion for i.hate.everyone, adding ponies and the fandom around them to the things you can make horrible jokes about. The expansion even has a pony mascot, Flippy! This includes 30 Status Cards and 74 Comment Cards. In order to play you will still need a base set, either i.hate.everyone or i.hate.fandom. It has lots of crude humor about ponies too, and is for mature players. This title was added to our catalog on June 22, 2014.